Artists paint for different reasons. Some paint for pleasure, some to convey a message or evoke mood, and others to reinterpret a specific subject. Native American artist Shonto Begay blends all of these ideas with his personal history as a Navajo while drawing upon his culture in its modern context. “My message is simple. Build bridges through the arts and stories of your culture, validate and share these visions and voices. Celebrate your personal identity through the arts. 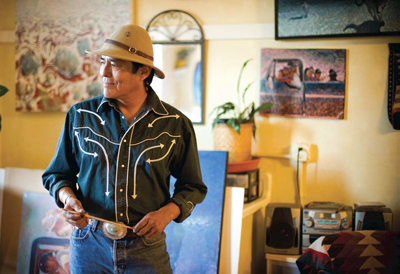 In my talks, I am as much a student as I am a teacher,” says Begay. 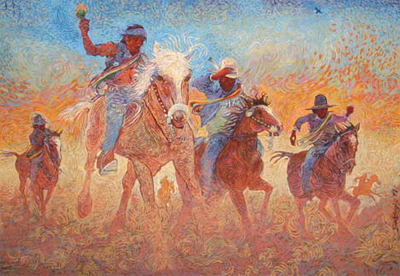 Shonto Begay, Desert Rock, Acrylic on Canvas, 24" x 12"
A professional artist since 1983, Begay’s work has been shown in more than 50 shows in galleries and museums including The Wheelwright Museum of the American Indian in Santa Fe, the American Indian Contemporary Arts’ museum in San Francisco and Phoenix Art Museum. Medicine Man Gallery will host an exhibition of his new works beginning Aug. 22 in conjunction with the Santa Fe Indian Market. 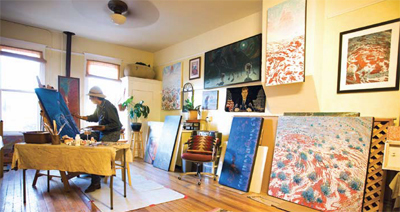 In his latest work, Begay continues his search for light and glow, both internally and externally. This year he’s mixing light with what he calls his ‘blue period.” He describes his paintings as neo-impressionism set in his own unconventional reality. 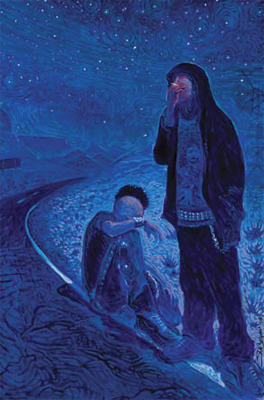 Begay’s blue pieces tackle some serious issues among today’s Native young people. Ideal examples are found in his paintings titled Desert Rock, Lights Too Close, and Beneath the Singing Wires. Desert Rock, in particular, depicts the youth environment as inspired by desecration that’s happening around the Navajo Nation in Desert Rock, Ariz. Beneath the Singing Wire shows two boys hitchhiking in the middle of the night; one is resigned to spending the night roadside while the other stands smoking. There’s a rich, blue sky in the background and a single amber glow represents hope and possibility, according to Begay. Working in an unconventional format, Begay’s new acrylics on canvas explore Navajo mythology while scratching the surface of his own existence. In his attempt to negotiate between sanctuaries, he paints what he knows and feels – subjects that affect him on a daily basis. Instead of talking to a psychiatrist, he says, he interprets his dreams on canvas, exploring their psychosis. 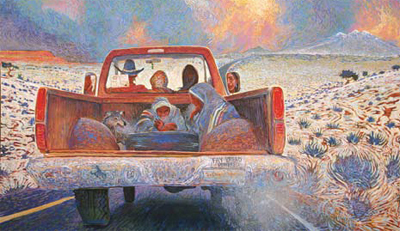 Shonto Begay, Our Promised Road, Acrylic on Canvas, 43.5" x 72"
In his new piece Our Promised Road we see Navajos driving to a ceremonial event with the San Francisco Peaks (Abalone Shell Mountain) in the background, which Navajos believe represents the Western gate to their holy land. It’s a simple composition of figures, a dog and mountains yet it speaks volumes. Using dynamic brushstrokes to portray steam, clouds and smoke, Begay instills a sense of life, of breathing and exhaling. The faces of the driver and one of the passengers are clearly visible in the rearview mirrors – simultaneously focused on the road ahead and their past. “They’re going on a ride of hope, a rite of passage,” says Begay, who resides in both Flagstaff, Ariz., and on the Navajo reservation. 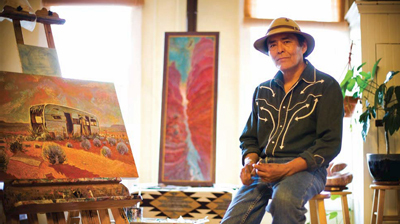 Shonto Begay's paintings reflect his beautiful heritage and the harsh realities associated with being a Navajo. The Booth Western Museum in Cartersville, Ga., found this painting so appealing because it depicts a regular occurrence that it plans to add it to its permanent collection. Shonto Begay, Lights Too Close, Acrylic on Canvas, 17.5" x 44"
Begay’s paintings marry his traditional ideals with modern. The dynamics of his surface speaks to viewers continuously. Rather than interpreting each piece, the artist prefers to let viewers draw their own conclusions. Shonto Begay, The Healing Ride, Acrylic on Canvas, 53" x 75"
“The most successful pieces I have can be read on many different levels,” he adds. His piece titled Mystery Canyon Passage inspires multiple layers of explanation. 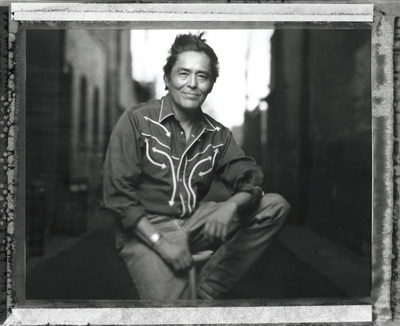 For Begay, it’s about negotiating between sanctuaries – between light and darkness – and trying to maintain one’s identity. He uses metaphors to allude to the woman’s journey, who’s modeled after his elder aunt, between light and darkness; between what’s good and bad for us. 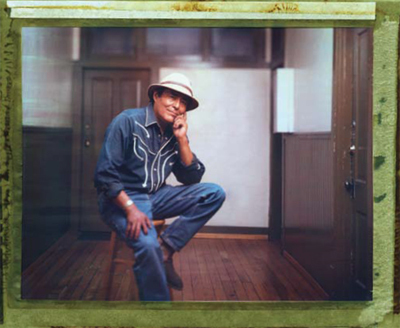 Shonto Begay's mantra is "celebrate your personal identity through the arts." 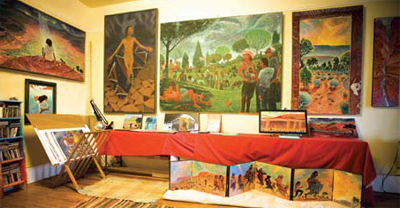 It’s Begay’s unique compositions and honest interpretations that appeal to a broad collector base, many of whom, he says, desire good art and want to be blessed with an image that continuously speaks to them revealing messages that translate slowly over time. “One collector said ‘it’s not good, it’s more than good, it’s important,’ and important work is so much better than a good one. It has intent,” he recalls. 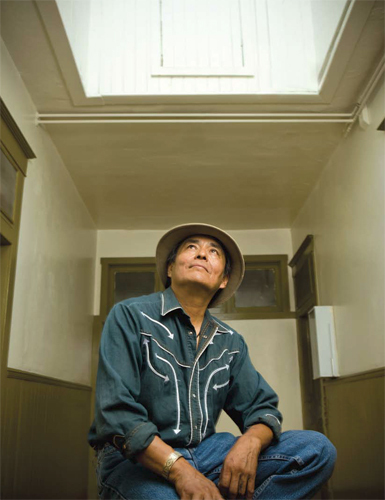 In his latest work, Shonto Begay continues his search for light and glow, both internally and externally.